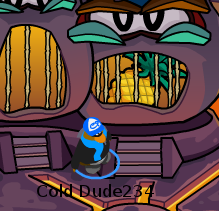 Cold Dude Computers: New Pineapple Costume Now Availabe! New Pineapple Costume Now Availabe! The third and final fruit was recently released for members! It is the Pineapple Costume! Go to the Snow Forts and make your way to the end of the temple. You have to keep throwing fruit into the tiki's mouth until he chews it. Then he will let you have the pineapple. This last costume is my favorite fruit out of all of those member ones! What's yours? Leave a comment and let us know!